Editor’s note: Dave Chase is the CEO of Avado.com, a patient portal & relationship management company that was a TechCrunch Disrupt finalist. Previously he was a management consultant for Accenture’s healthcare practice and founder of Microsoft’s Health platform business. You can follow him on Twitter @chasedave. This is the second part in a two-part series on strategic investors in healthcare. Healthcare IT departments have focused much of their attention on the $19 billion portion of the stimulus bill that is providing billions of subsidies for the adoption of electronic health records. While this is logical given the available money, it is paying for health IT systems optimized for the “do more, bill more” model of reimbursement that is rapidly being replaced by a value and outcomes based – a 180 shift in focus. It’s hard to argue with modernizing the record-keeping in healthcare that isn’t far beyond how medicine was recorded in the time of Hippocrates. Thousands of lives are saved as a result of this modernization (e.g., avoiding frequent, deadly prescription errors). On the other hand, most companies benefiting from the stimulus have two massive gaps that will need to be addressed for health systems to thrive in the new environment they are facing. The core of the legacy healthIT systems was optimizing the reimbursement model where the “patient” isn’t much more than a vessel for billing codes. For entirely rational reasons given the legacy reimbursement model, their success was measured by their ability to get as big of a bill as possible out as fast as possible. The shift to a value and outcome based model of reimbursement literally flips provider incentives on their head (e.g., hospital readmissions are penalized rather than rewarded). These systems were designed for a static healthcare system with rigid technology architecture not known for its nimbleness. There is one area of consensus about the future of the U.S. healthcare system — it’s destined to go through radical transformation. Nimble systems will be required to respond to a rapidly changing landscape. Filling these gaps present an opportunity for investors of all stripes — particularly strategic investors such as those associated with health systems and pharmaceutical companies. It is becoming crystal clear to healthcare providers that what they thought was going to be their 100% solution is really best optimized for just 25% of where healthcare money is spent (hospital-based care). Critically, 75% of healthcare spend is directed towards chronic disease. Legacy healthIT have their strength in automating internal workflows of hospitals and other clinical settings. In those high intensity settings, healthcare providers make the decisions that drive the patient health outcomes. With chronic disease, it’s an entirely different story. The decisions a person (or their family) make drive the health outcomes. For example, does the patient fill a prescription and take it properly (more than half don’t)? Traditional healthIT does virtually nothing to ensure that people make the necessary lifestyle choices to optimize their health. Healthcare providers who have demonstrated the most impressive positive results with challenging patient populations recognize that there are two main care approaches. Many leading hospitals have adopted a manufacturing-based model borrowed from Toyota. In contrast, with chronic disease, a service-based approach is necessary to effect behavioral change. In a manufacturing setting, with enough practice a machine will do what it is intended to do and doesn’t have a mind of its own. However, as anyone who has been in a service-based business knows, human interaction frequently leads to the best outcomes if there is any complexity. The following is an analogy from Dr. Douglas Eby who is a leader in one of the health systems that has the most impressive results in a very tough environment (click here and see video at the end of the article for more). Think about throwing a rock at a target. Similar to a manufacturing scenario, with enough practice a well trained professional can hone their skills and hit the target most of the time. Now imagine rather than throwing a rock, you are throwing a bird at a target. Perhaps you can impact 10-20% of whether that bird hits the target. However, the other 80-90% is going to be driven by understanding the bird’s motivations. Perhaps putting food or the bird’s babies at the target would be necessary to drive the bird’s behavior. Like the bird example, doctors push patients toward a desired health target. However, only those healthcare providers that have systems and processes optimized for engaging patients have had significant success with chronic conditions. As highlighted in The Rise of Nimble Medicine , the healthcare providers driving breakthrough results aren’t tweaking an existing model. Rather, they have developed new models that are repeatedly tested and optimized. As one who has implemented traditional healthIT systems at healthcare providers ranging from small rural facilities to large inner-city hospitals, the process is very involved with months of planning before go-live. During that process, there is a boatload of process planning and re-engineering before configuring the system to reflect what has been decided. The process is weighted 80-90% toward pre go-live with 10-20% focused on post go-live to deal with go-live issues and further training. Contrast that with highly dynamic environments where the pre and post live weighting needs to be flipped on its head (i.e., 20% planning, 80% analyzing, refining, testing, etc.). While some areas of healthcare will be stable, the most critical area to manage is where the greatest costs reside — chronic disease. Best practices have begun to emerge, however one can expect rapid iteration to address the various areas of chronic disease management. Some of the legacy systems such as Epic have strengths in its ability to address different workflows after significant customization (this is why even small to medium sized health systems spend north of $100 million on their implementations. However, healthcare providers report that if they need to reorder workflow, the system has to be reconfigured with significant time and expense involved. Eric Page of Amplify Health has shared his experience doubling the national average for outcomes related to sleep disorders. Page described their experience as one that involved repeated testing and re-ordering of steps in the process. Changes were made day by day. I expect that rapid iteration will become the norm for the leaders of the next generation of healthcare delivery as they hone their craft. In a piece for the New Yorker, Dr. Atul Gawande outlined how, early in the 1900s, more than40% of household income went to paying for food and food production consumed roughly half the workforce. Beginning in Texas, a wide array of new methods of food production were tested. After many pilots, tests and information dissemination, food now accounts for 8% of household budgets and 2% of the workforce. As a wide array of small innovations ultimately led to the transformation of farming, so too is a rapidly building wave of innovative new care and payment models leading to similar breakthroughs in healthcare. I call this Nimble Medicine. “Listen to your patient, he is telling you the diagnosis” William Osler, M.D. Health systems have begun with modest efforts to weave in patients into the care process. Amazingly, simple secure messaging has been held up as a great breakthrough in medicine. That a technology (email) that has been around for 40 years is held up as a breakthrough, in and of itself, is a statement. I liken the limited efforts to invite the patient into the process to sipping from a muddy puddle of water in the Sahara Desert — it’s a welcome improvement but far from arriving at the promised land. Healthcare organizations that will thrive (not just survive) recognize that a tweak to systems (both healthIT and business process) that were designed around the patient as billing vessel will fail miserably. As we’ve seen in many areas, tweaks to an architecture designed around a different model never succeed in the new paradigm. If they did, AOL and Yahoo would be the leaders in social media and Siebel would be leader in CRM. Before long, you will see the equivalents of Facebook and Salesforce.com emerge in healthcare. Behind virtually every business model in healthcare delivery has been an assumption of real estate bubble like perpetual healthcare inflation. It’s not hard to predict that deflationary economics will drive healthcare in the future given the government budget crises from Main Street to DC that are largely driven by healthcare costs. While one expert warns of health care bubble another calls the upcoming period The End of the Third Bubble (PDF). Unsurprisingly, those who thrived after past bubble bursts were those with lower costs structures and systems that were nimble. 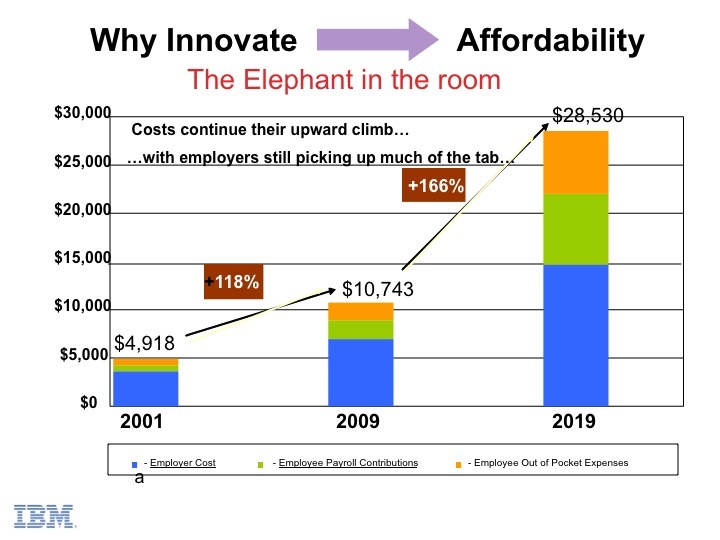 The diagram below is one of the drivers for why employers such as IBM have aggressively changed their healthcare buying approach. Cost-cutting isn’t limited to the government. Why? It is employers who foot most of the ever-expanding healthcare tab and are starting to flex their muscle. For example, IBM has shifted from thinking about healthcare as an employee benefit to a large cost driver that will impact their profitability. IBM recently made a decision as to where to locate 4,000 new hires based on their analysis of where they received the best value from their healthcare expenditure. Consequently, they determined that Dubuque, Iowa was the best location to expand their employment. With wide cost differentials, it’s conceivable that CFOs and CEOs will believe that their fiduciary responsibility to shareholders will necessitate the kind of analysis IBM acted upon. If they don’t, they are liable to get lambasted by Wall Street. 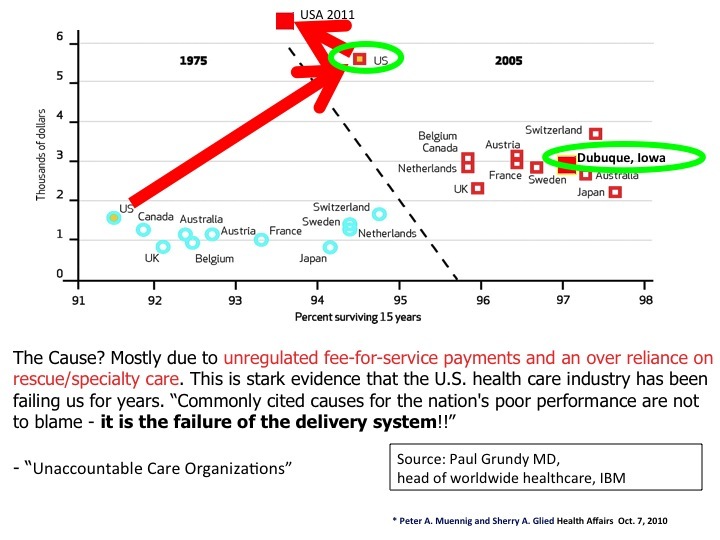 This kind of analysis is a scary prospect for communities that are high cost locations for healthcare. It may shift how communities think about economic development. Having a great ROI for healthcare may be of greater benefit than a tax break. Conversely, communities with expensive healthcare have what amounts to a healthcare “tax” that will push businesses away. Many health systems operating at a loss or a razor thin margin, may wonder how they can deal with these changes. Smart healthcare providers are taking painful lessons from the failings of another industry that consisted of local monopolies and oligopolies that seemed protected by capital infrastructure barriers to entry — the newspaper industry. The few newspaper organizations that have thrived realized that it can still be profitable to operate on a lower cost structure. With the majority of hospitals operating as non-profit, mission-based organizations, they should have a relatively easier time making the transition. Non-profit organizations don’t have to explain to public markets why a flat or declining top line revenue figure can be a good thing (assuming they get costs optimized for the new normal). As an example, already forward-looking organizations have already bucked conventional wisdom thinking they need to acquire practices to develop an accountable organization. I have seen both non-profit and for-profit health systems recognize it is more capital efficient to create strong physician networks via open software solutions than acquiring practices and mandating a closed system. Given where most revenue comes for a health system, their optimization has been focused on hospital-based care. Even there, the new reimbursement framework takes into account what happens after a patient leaves the hospital. That is, there will be large and ongoing penalties for hospital re-admissions. In the old world, hospitals have been rewarded when someone was readmitted. Consequently, there was little focus on addressing post discharge patient engagement…until now. However, the biggest changes are coming with the shift from a reactive to proactive model when it comes to chronic disease management. In the old reimbursement model, health systems waited for someone to present themselves at the hospital and that was viewed as more revenue to add to the coffers. Going forward, health systems will be accountable for people even when they leave the facility, and so will face an entirely new set of information technology demands. It’s why you see some hospitals going around floors with iPads ensuring patients about to leave have a scheduled visit with a doctor after they leave. The healthcare providers understand that is one of the best ways to avoid re-admissions. Before, 84% of people died at the hospital. Today, 90% die at home which is greatly preferred by most people. This is enabled, in part, by video conferencing, remote monitoring, etc. Before they had 157 hospitals. Today they are down to 21 (with corresponding reductions in hospital days). 80% healthcare encounters are asynchronous which better fits people’s schedules for non-emergent item. To sum it up, to support the array of new demands, healthtech will need to be human-centric, affordable and nimble. These aren’t the adjectives typically applied to traditional healthIT systems. Just as we have observed the military frequently spending money on capital built for the last war such as aircraft carriers and other slow moving military tools. Over time, the military learned that it was as much or more important to focus on the hearts and minds of those they were trying to work with and that remote intelligence tools have been highly effective at winning battles. When it comes to managing chronic disease, winning the “hearts and minds” of patients and remotely monitoring health are similar skills not factored into systems developed for the legacy reimbursement model. Therein lies opportunity for healthcare investors to look to innovative approaches from startups experienced in engaging consumers. Strategic investors, in particular, have extremely high motivation as their traditional businesses get disrupted. As we saw with the shift from analog to digital media and landlines to cellular technology, entire new categories of software emerged that trumped tweaks to legacy systems. The early customers and partners of the new categories of software were the ones that were able to manage the industry shift. The shift from the “do more, bill more” reimbursement model to the value and outcome based reimbursement model in an industry larger than any other creates an opportunity strategic investors seek to capitalize upon.